The newest weapon in the consumer electronics industry’s arsenal aimed at separating you from your hard earned dollars is 3DTV and this weekend sees retailers the length of the country featuring 3DTV sets in store. If the shoppers huddled in front of the Samsung 55 inch LED 3DTV at JB Hi-Fi in Auckland’s Westgate shopping centre are anything to go by, there’s plenty of wow factor in 3DTV, but still not enough to compell people to put their hands in their pockets. All of the shoppers I observed donned the 3D glasses watched for a few minutes with wide grins on their faces and promptly handed the glasses back to JB’s well-informed salesman. 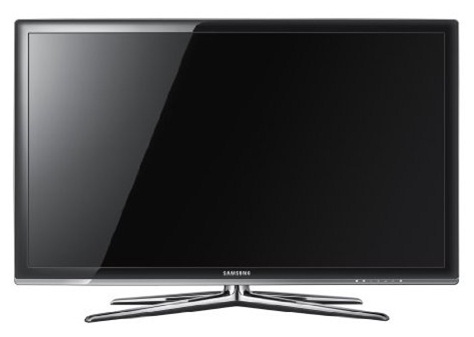 The Samsung UNC55700 is one of the first 3DTVs to go on sale here and it is an impressively configured system. It is based on LED backlighting technology rather than conventional CCFL, which means it is incredibly thin (26.5mm) – a wonder to look at from a hardware point of view, with its thin profile and elegant steel stand. It has a USB slot allowing you to play content directly from a portable hard drive. But it is what is displayed on the screen that separates this TV from others. This TV, one of the new members of Samsung’s 7000 series, displays 3D images which require you to wear 3D glasses. The Samsung 3DTV set I looked at will either display an image in 3D transferred from a 3D source, such as a 3D Blu-ray player or a 3D broadcast. It can also convert regular 2D content from DVD and Blu-ray players as well as broadcast TV and video games to 3D. It was this 2D – 3D conversion that was on display at JB Hi-Fi as the HDMI version 1.4 cable required to send the 3D signal between the 3D Blu-ray player and the Samsung 3DTV set haven’t arrived yet. Very little content is currently available in 3D Blu-ray format, though the number of titles released in the format will improve considerably in the coming months. 3D broadcasts, aminly of sports coverage is planned for the US but realistically is years away from debuting in New Zealand. The most likely provider of this type of content would be Sky TV, though free-to-air providers like TVNZ are understood to be very interested in the format. The show on display at JB Hi-Fi was the animated Hollywood blockbuster from last year, Monsters vs. Aliens. I was very impressed. With the 3D glasses on, I watched numerous oddly-coloured characters embark on some highspeed adventure. The sense of depth the 3D provides is impressive, particularly in fast action scenes, when the characters literally do leap out of the screen at you and in shots where background images seem to float in space, giving a rich perspective of depth. I looked carefully for so-called image crosstalk, which appears as a sort of ghosting around images and objects. That has been a criticism of some early 3DTV sets, but seems to be more aimed at native 3D content ie: content played from a 3D source rather than 2D – 3D converted content. I had problems with the Samsung 3D glasses, which appeared to shut off and dim from time to time. The JB man tells me that has to do with the horrible fluoro overhead lights in the JB Hi-Fi store. When the glasses were activated, the picture was indeed crisp and bright. The viewing angle was reasonably good, with the 3D effect clearly visible around 1.5 metres to each side of the set. Ideally, you would want to watch a 3D movie in a darkened room, as the 3D effect results in some loss of brightness and sharpness that background light sources can exacerbate. The Samsung glasses are fairly stylish – definitely a step up from the Dolby pair Avatar audiences in cinemas received. The glasses are powered with a lithium ion battery and can be recharged by plugging them in via the USB port on the TV set or Blu-ray player. JB’s salesman said two pairs of glasses are included in the Samsung 3DTV bundle while additional pairs can be bought at around $100 each. I could definitely handle wearing these glasses for a full-length movie. Apparently you can expect up to 50 hours of viewing between charges. After leaving the shop, I felt a little fuzziness in the head and soreness behind the eyes – that was after about 20 minutes of viewing. The extra strain on the eyes and brain of decoding the 3D images definitely make for harder going viewing which will but off some, especially those who, like I, wear glasses anyway. I was pleasantly surprised at the Samsung 3DTV picture quality having seen 3DTVs over the past few years at trade shows around the world and been sceptical at their potential for the lounge room. Given that the lighting in the JB Hi-Fi store was fairly horrible and I was only watching 2D – 3D converted content, I’d say the experience would be far better with a native 3D source and a dark room. But it is very early days for 3DTV and the industry is in danger of repeating the mistake it made with Blu-ray technology – introducing the hardware before a good selection of well-priced content was available. As such, in the Australasian market anyway, Blu-ray uptake has been low, with only the PS3 video game console a major seller as Blu-ray is built into the console by default. On the subject of gaming – I haven’t played video games in 3D format, but have read positive reviews of Playstation and Xbox games that have been converted from 2D to 3D for playback on the Samsung 3DTV. I think this is a major opportunity for the gaming industry, and a firmware update will allow the PS3 to play 3D content. Overall I think 3DTV has good potential but it is very much in early adoptor phase at the moment. With a lack of 3D blu-ray players in the market, virtually no 3D content on sale and no plans for 3D broadcast television locally, 3DTV is a nice luxury that may lure some TV buyers upgrading to LCD and keen to take advantage of the Samsung’s impressive conversion abilities. For the rest of us, it will really be the next TV upgrade cycle that will introduce us to 3DTV. JB HiFi was offering a fairly impressive deal on the 55 inch 7000 series LED 3DTV, with the TV, a Samsung 3D Blu-ray player and two pairs of 3D glasses for around $5500.